configuration with the release version of libtorch, which is not allowed for MSVC. I’m sure it’s release configuration, and if I load and forward with a model which is generated from the tutorial code(https://pytorch.org/tutorials/advanced/cpp_export.html), this problem will not occur. It doesn’t matter which linked library has debug symbols or not. 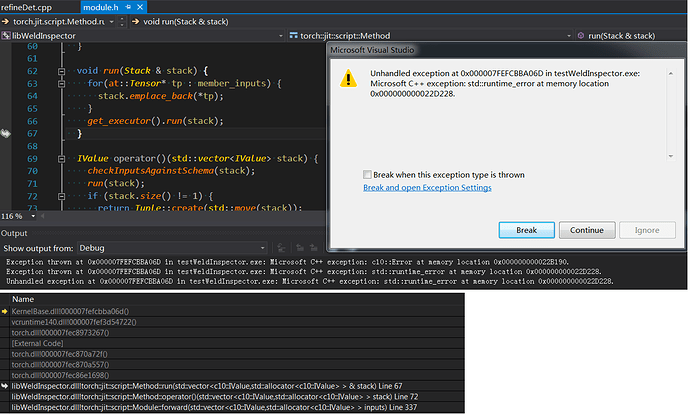 From what I heard, MS C++ does not allow linking a release library to a debug exe. Something about ABI incompatibility. Could you try again with nightly debug version of libtorch so that we can get a detailed stack trace?